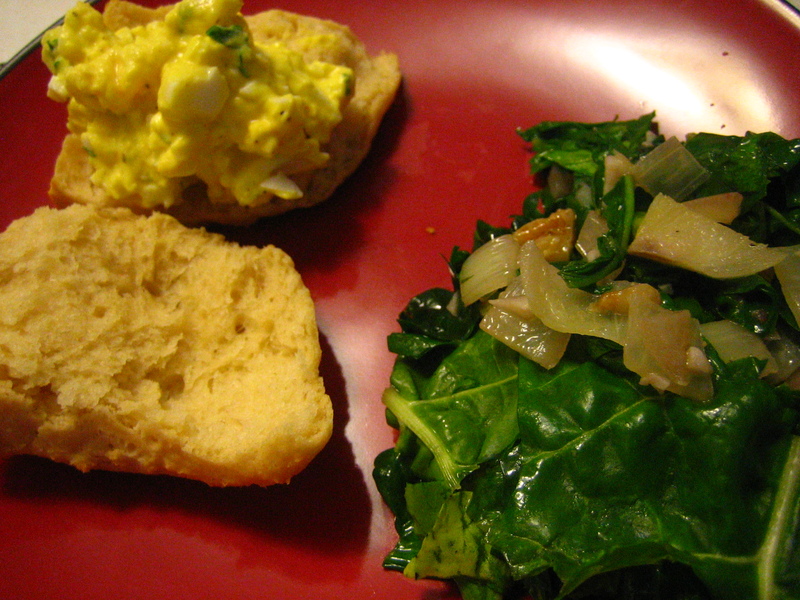 We made these simple and completely amazing biscuits a few weeks ago as an accompaniment to sauteed chard and egg salad made with garlic and yogurt. The egg salad and the biscuits both come from a great new cookbook I was given by friends of ours. Preheat the oven to 450 and place an ungreased baking sheet in the oven to preheat as well. Combine the dry ingredients in a bowl and then cut in the cubes of butter. Mix/cut until the butter is the size of “tiny pebbles.” And the yogurt and mix until just combined. Avoid over mixing, dry patches are okay. 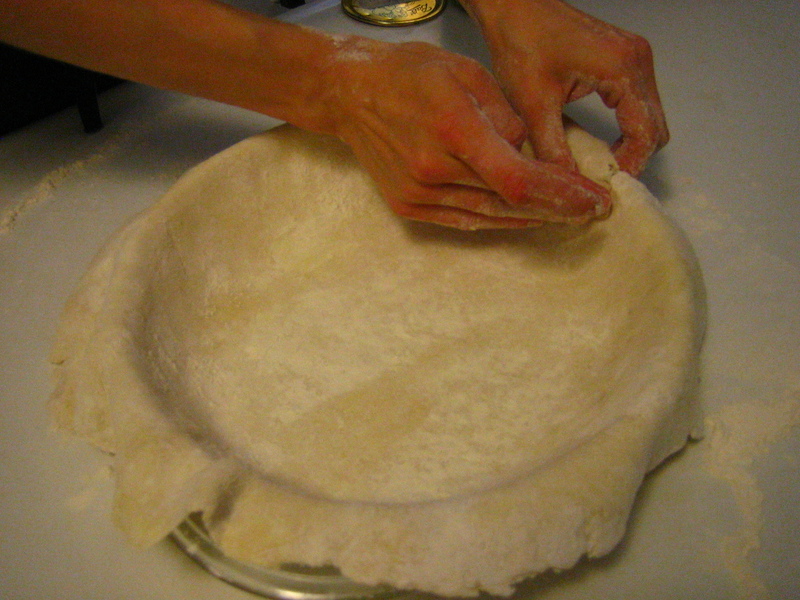 Make the dough into a ball, place on a floured surface, an knead five times. Then press the dough into a square about an in ch thick. Cut the dough square in half and stack the two halves. Do this twice more, flattening, cutting, stacking. Add more flour as needed to prevent sticking. 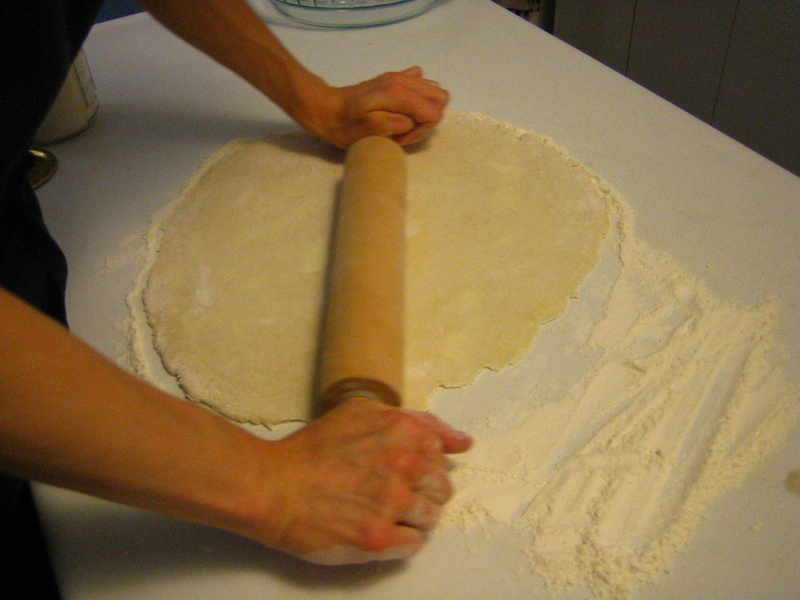 Press or roll the dough into a 3/4 inch thick rectangle. Don’t let it be any thicker than 3/4 of an inch. 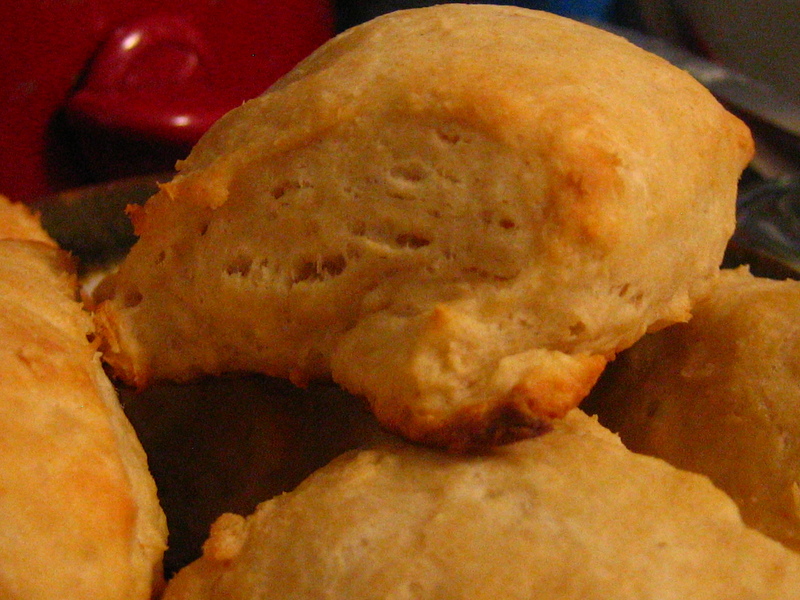 cut the dough into 12 equal square biscuits and put them on the preheated baking sheet. Leave at least 1/2 an inch space between them for expansion. Bake for 15-18 minutes, until the bottoms are golden brown. We ate them with the egg salad (yogurt instead of mayo and 1 teaspoon of chopped garlic) and chard cooked steamed with cooked onions and garlic. Delightful. Having once eaten mediocre vegetarian massaman curry in a college dining hall, I (librarian) recently felt inspired to concoct my own version of this dish. 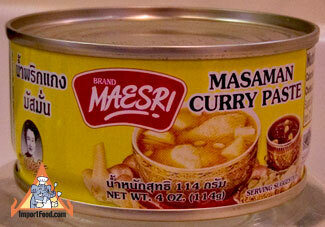 After scouring our rural town’s minimal grocery stores for months, the recommended massaman curry paste finally appeared on the shelf of the natural food store a few weeks ago. 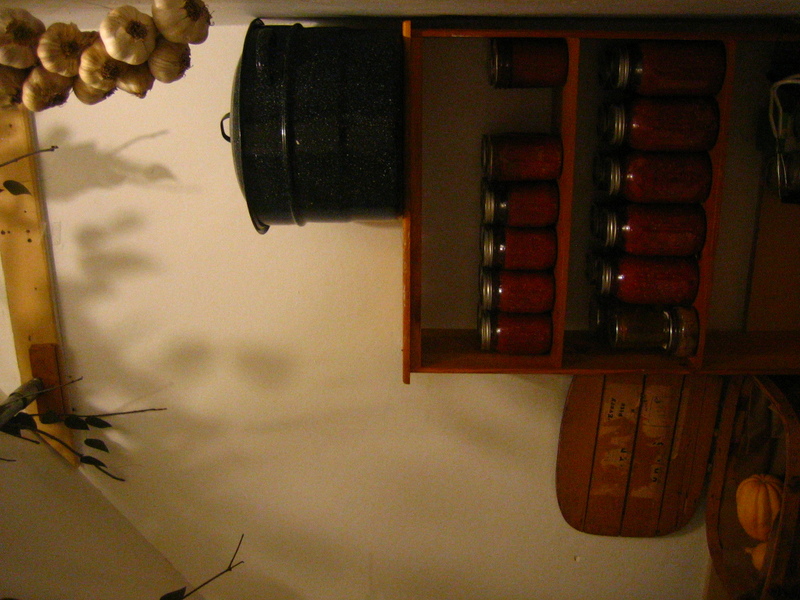 So I looked around the root cellar and the fridge for what vegetables we had to work with. December isn’t the most inspiring time for vegetable eating, but I came up with sweet potatoes, Asian greens, onions, and garlic. I swapped the usual tofu for a can of chickpeas. I also made the rice with my favorite new method: crock-pot-as-rice-cooker. Without further ado, here’s my version of vegetarian soy-free seasonal vegetable massaman curry. 4-6 servings (over rice) – Takes about 1hr20 for me to prepare, so you’ll probably be faster. 1. Grease the bottom and (lower) sides of your crockpot with some butter or oil. Put in 1 cup of uncooked white rice, a pinch of salt, and 2 cups of water. Set your crockpot to high, cover it, and get to work on the rest of the curry. I found that this dinner was timed nearly perfectly with the rice being done. 2. Peel and cube the sweet potatoe(s). Set it/them up to boil for about 15-20 minutes in a saucepan. 3. While the sweet potatoes are cooking, wash and chop the greens. Dry them and set aside. 4. While the sweet potatoes are still cooking, chop the garlic and onion. 5. Once the sweet potato cubes are cooked (easily pierced with a fork, but still holding their shape), drain them and put them into a large bowl. 7. Stir it all around and cook over medium-low heat for a few minutes. 8. Once the sauce is combined, add in the rest of the coconut milk. Cook for about 5-10 minutes until the sauce is heated through. Be careful not to let it burn – you may have to turn the heat down and stir quite frequently. 9. Add back the sweet potato chunks and stir until covered in sauce. Now is a great time to test the seasoning – I added a bit more soy sauce and sesame oil. You might want to add a bit more curry paste if you like a spicier curry. 10. Add the chickpeas. Once those are warmed and covered in sauce, check the status of your rice. If it’s not nearly done, I’d recommend shutting off the heat to the curry. Leave it covered while you wait for the rice to be done. 11. Check on the rice after about 1hr – 1hr15. You might want to fluff it up a bit just before it’s finished. 12. When the rice is done, turn the crockpot to warm. Stir the greens into the curry and cook over low heat until the greens are wilted and incorporated with the curry. 13. Serve your delicious curry over rice! 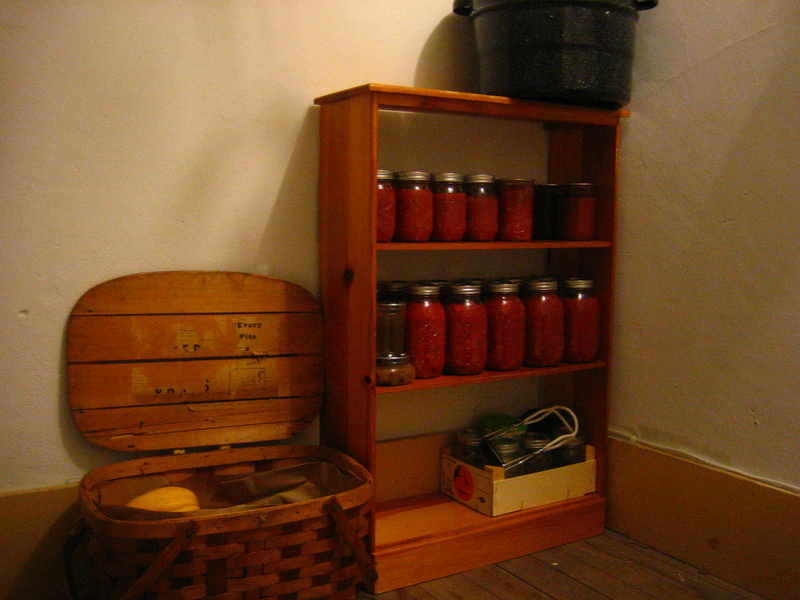 As we move into the long, dark, cold, small-farmers’-market part of the year, we decided it would be worthwhile to again investigate ways to store our veggies and have them keep well. 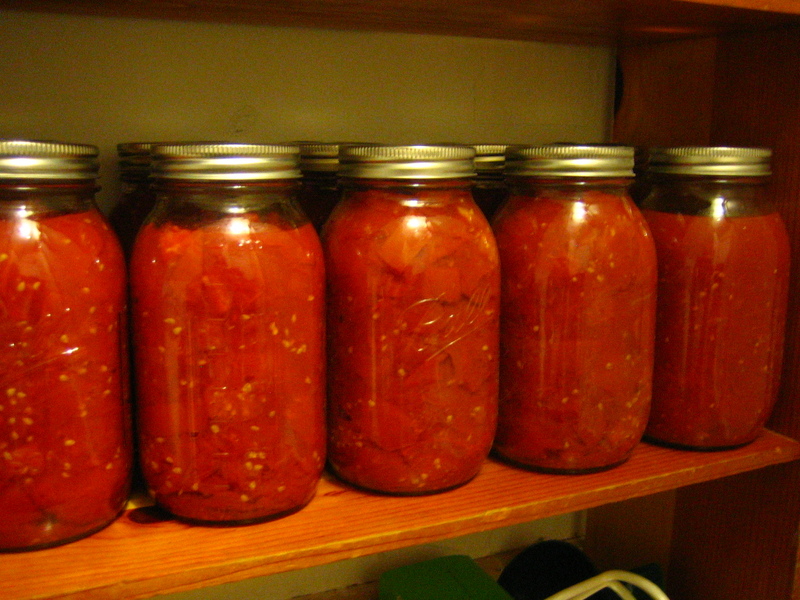 An inexpensive second-hand bookcase holds our canned tomatoes to keep them cool. 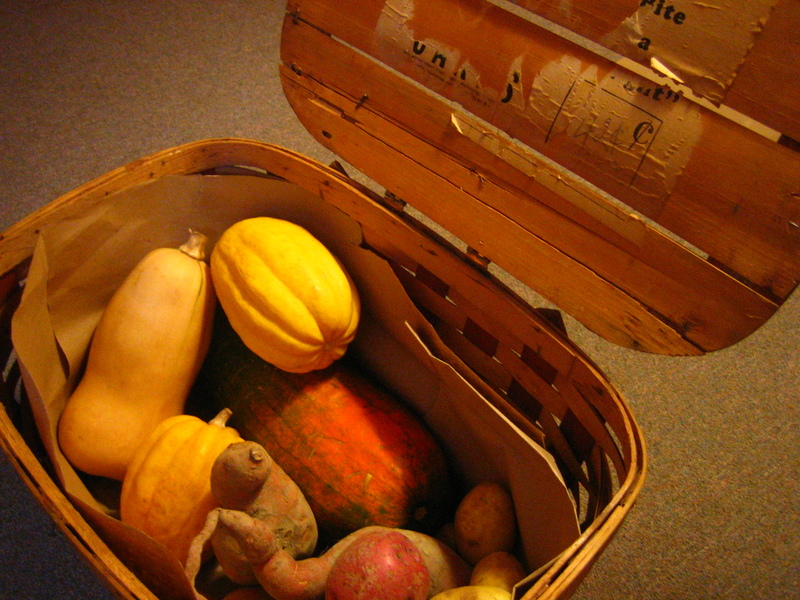 This awesome old basket, lined with brown paper, holds our squash, onions, shallots, and potatoes. And these beautiful garlic braids, a gift from friends, hang from convenient nails on the walls. Altogether, it is both nice and dark and cold, and also pretty cute looking. Those leaf shadows are from the cool branches we lodged up there. 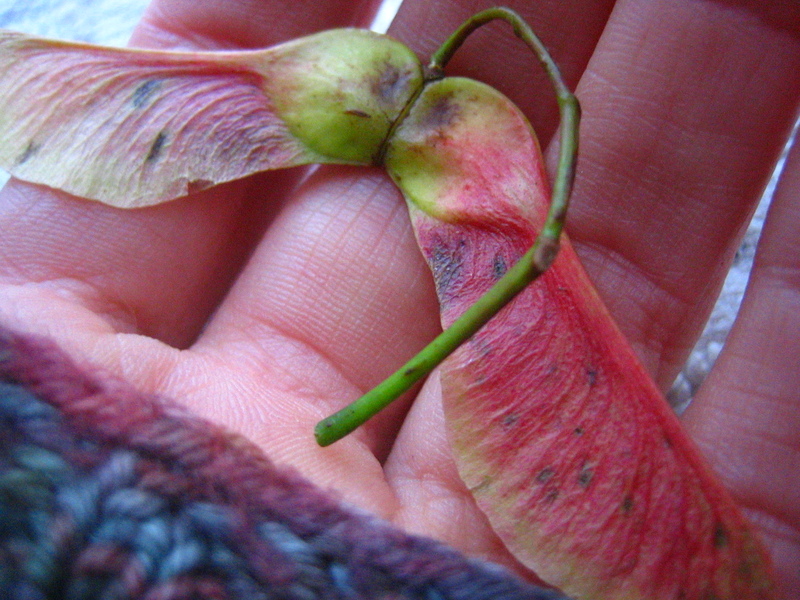 There are lovely little silk leaves we made from some of my fabric scraps and strung onto thread. 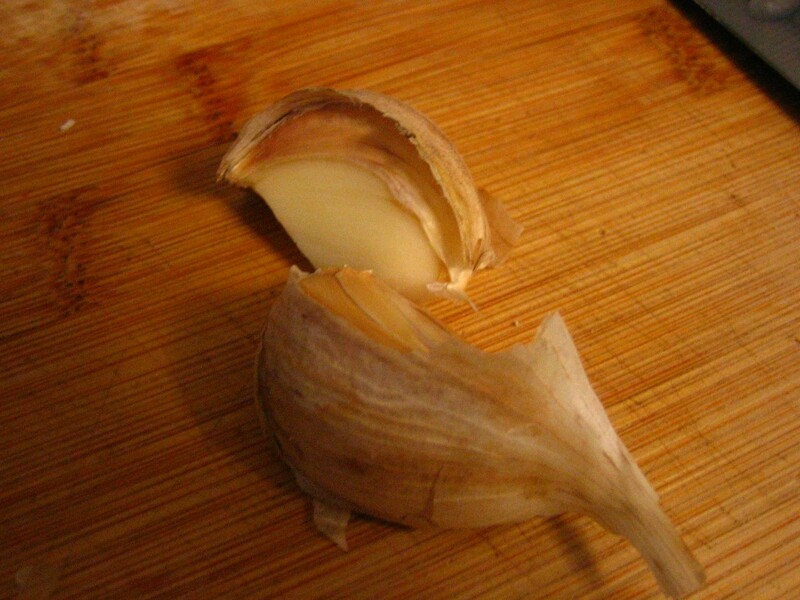 The only downside of our root cellar is that we no longer have a guest room, or rather our guestroom and spare blankets, mattress, and pillows, are all beginning to smell heavily of garlic. Pie: and why I feel like the coolest person ever. 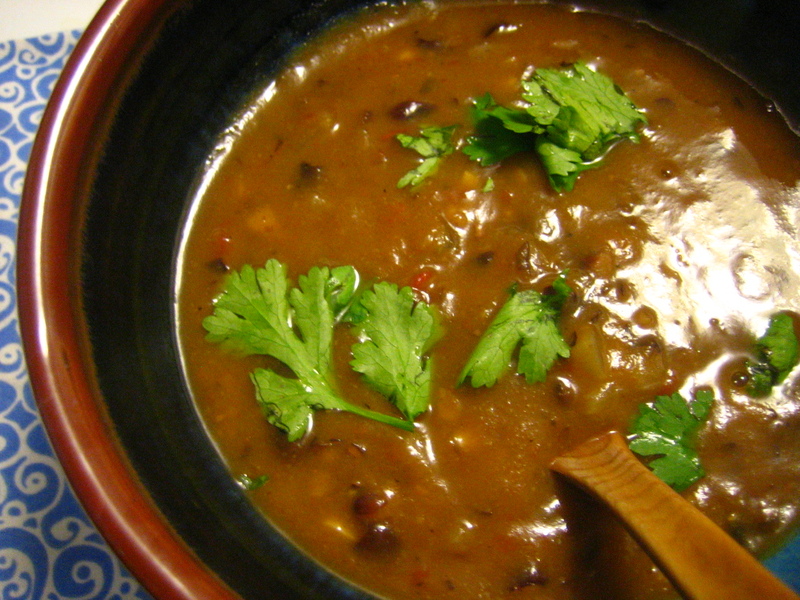 So, we made that pumpkin and black bean soup a few weeks ago. 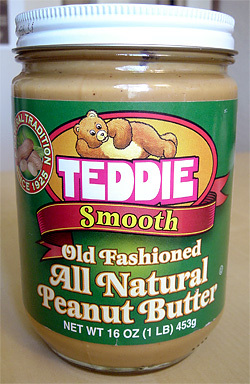 And, since we used real pumpkin, this left us with half a roasted pumpkin, nicely pureed and ready to use. Now, I’ve never made a pie before. Sure I’ve helped pour filling into crusts my mother or father have made. 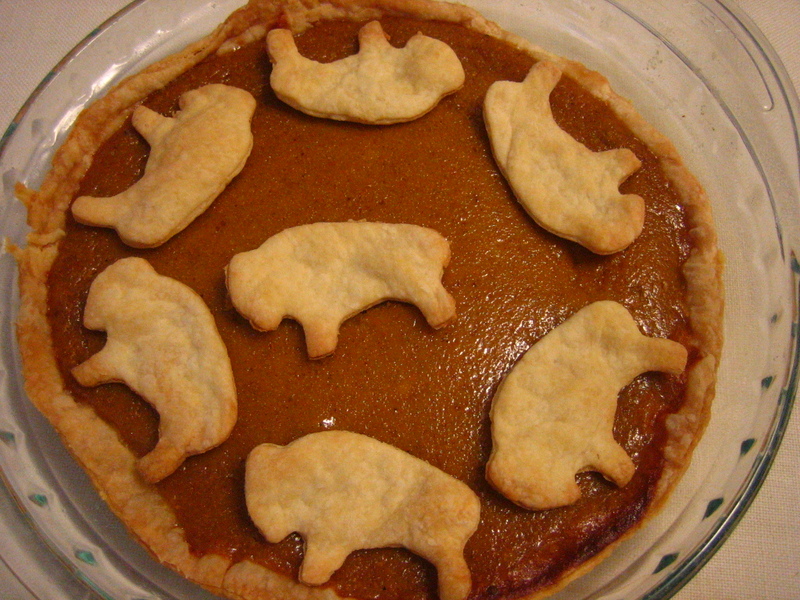 And I’ve laid little pie-crust leaves on top of pumpkin pies at Thanksgiving. But I’d never actually made a pie myself. But the idea really stuck with me. So, my first ever pie: pumpkin maple with a crust so delicious I couldn’t believe it. This was seriously one of the best pie crusts I’ve ever had. Fill one cup with extremely cold water (Smitten Kitchen recommended putting some ice cubes in there, but since we didn’t have any ice, I just put the whole measuring cup in the freezer for a few minutes). In a large bowl combine the flour, sugar, and salt. Cut two sticks of very cold butter and put them in with the flour. Since I don’t have a pastry blender I used our whisk to mix them all together. I did this pretty quickly, to keep the butter from getting soft. when the butter was in pieces which Smitten Kitchen calls the size of small peas. Slowly pour 1/2 a cup of the cold water over the mixture and use a spoon to mix it all together. Add more water one tablespoon at a time until it’s mostly sticking together well. 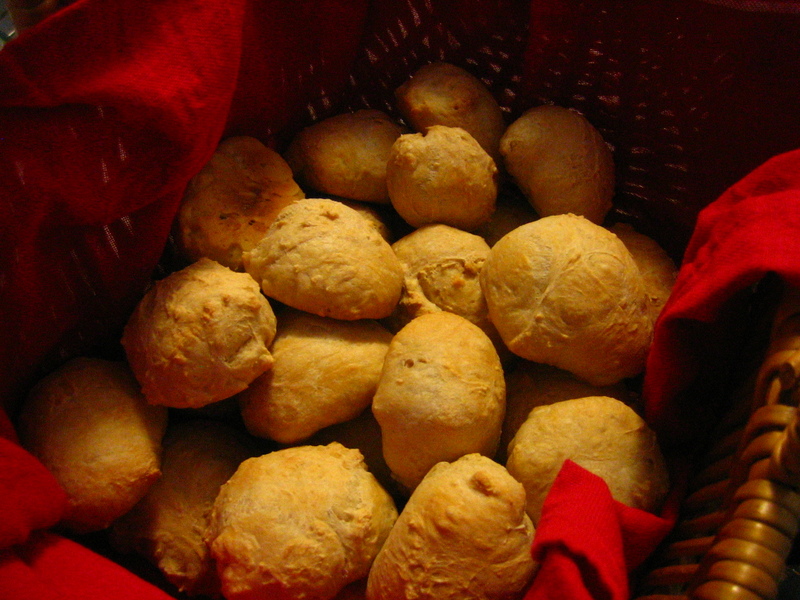 Lump the dough together with your hands, kneading a little and gently so that the dough makes a cohesive ball. 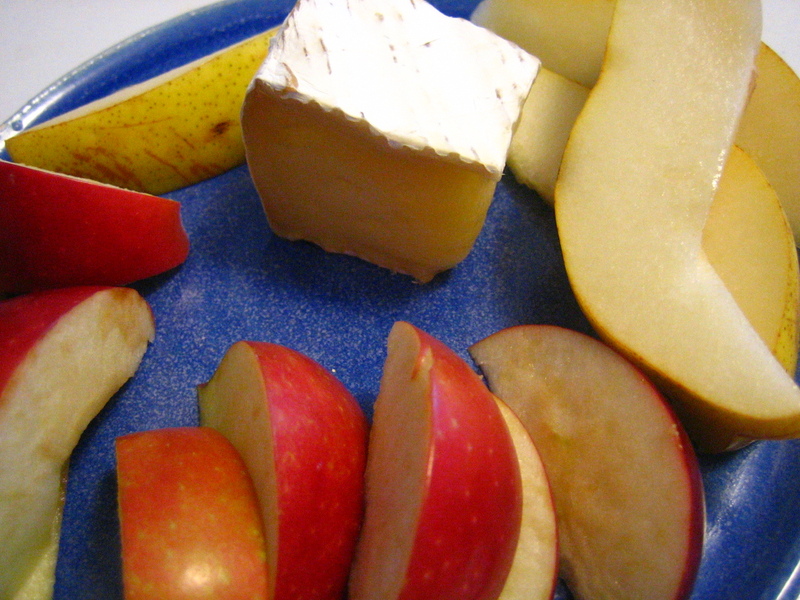 Wrap in wax paper and refrigerate for at least 2 hours. When you’re ready to make the crust: get your dough (divided in half since this recipe makes two crusts). Using a ton of flour roll it out to about 1/4 inch thick. Lift the crust into your pie pan and press into shape. 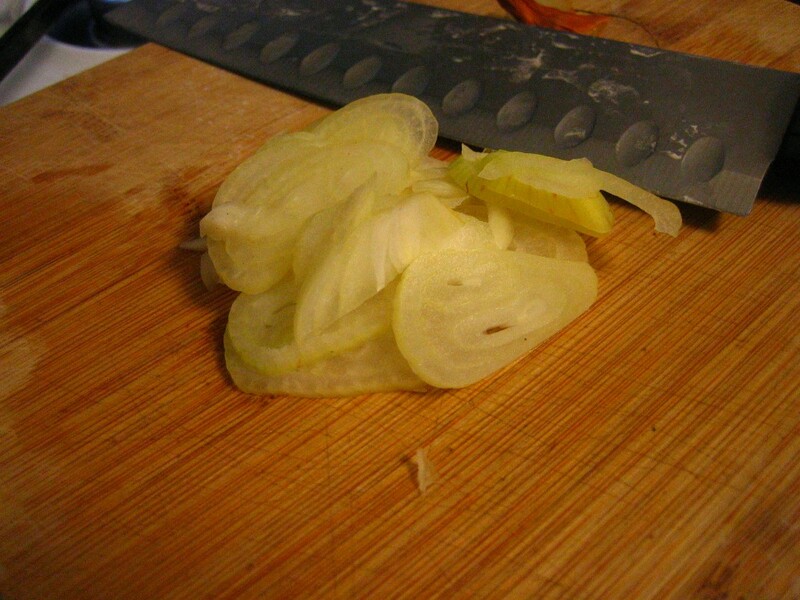 Use a sharp knife to cut off the excess. Shape the edges in a pretty way and then weight the bottom with parchment paper and dry beans. Pre-cook for 10 minutes at 350 then remove from the oven and remove the dry beans. Use the extra crust to cut out cool shapes. Pre-cook these for 8-10 minutes on a sheet. Combine the dry ingredients. Then, separately, combine the other ones. Mix them all together, pour into your amazing pie crust, and pop in the oven, again, at 350. Bake about 25 minutes, then put your fun shapes back on top and bake another 10-15 minutes. It’s a Martha Stewart recipe my mother recommended, but again, it wasn’t amazing filling. Good, but not as good as the crust. And here is your pie! So, this is both our final CSA list and our return to the farmers’ market list. We are endlessly greatfull for the bounty of both our CSA and our market. We were lucky this past, wet, and flooded season: our CSA continued until it’s end last week with great shares every week. 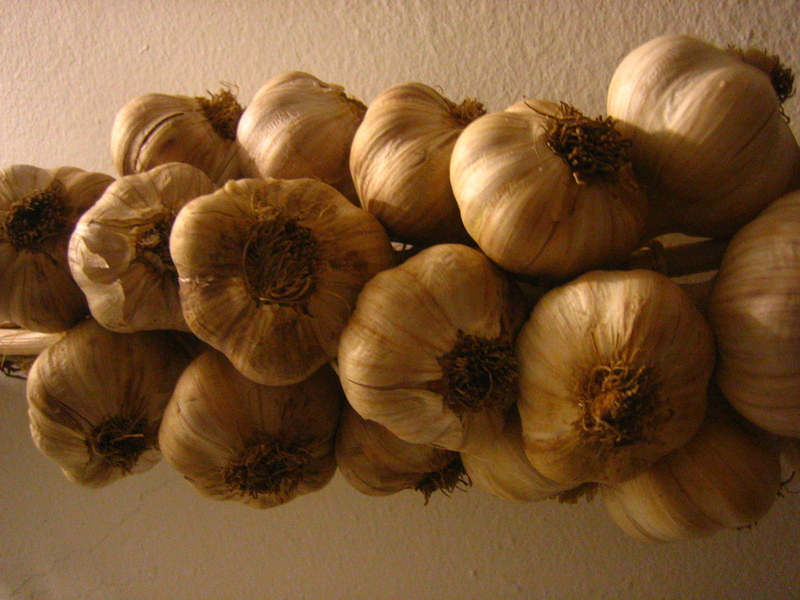 And the largest volume of garlic we have ever had. Crispy potatoes are simple and delicious. They’re made in the oven, but the serious amount of oil involved takes these far away from the semi-healthy category of oven fries (and into a category of incredibly delicious). I started with 2 medium-sized red potatoes, 2 shallots, and 4 cloves of garlic. 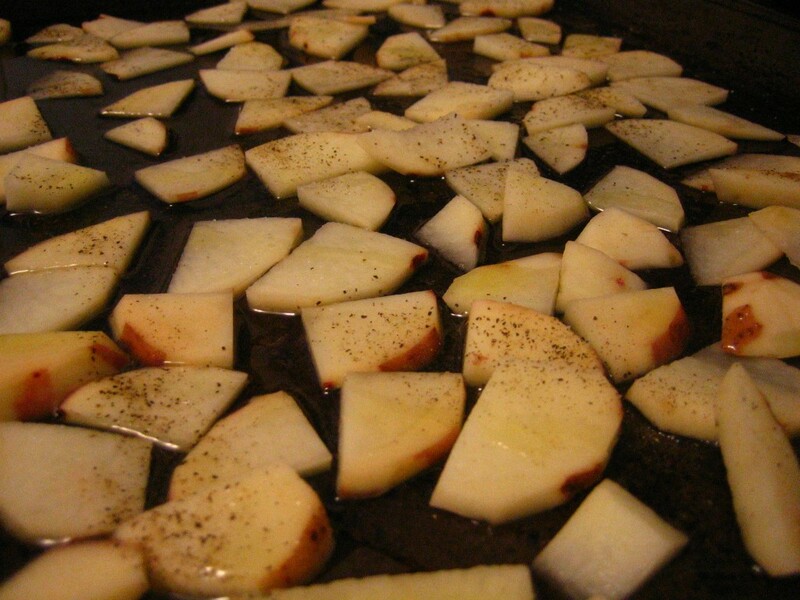 Pour some olive oil into the pan and place the thinly-sliced potatoes into a single layer. 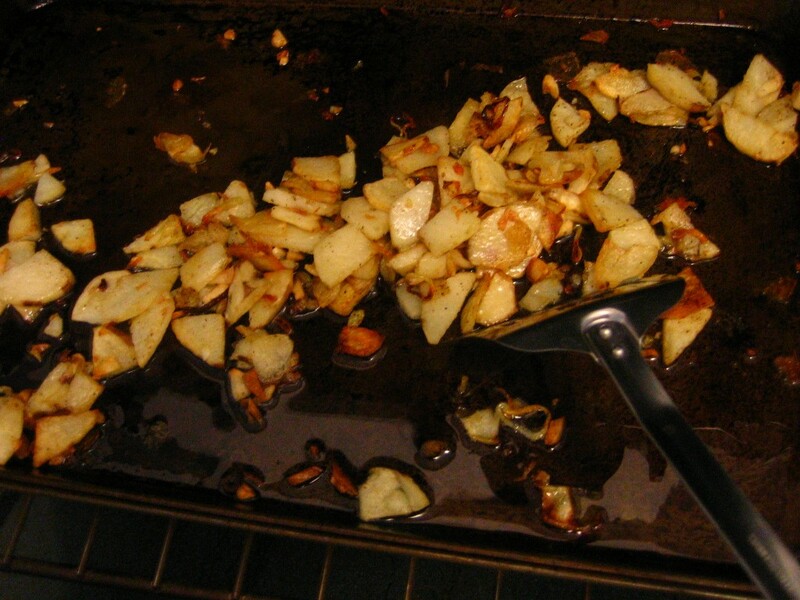 Wait about 5 minutes before putting in the oven – this allows the oil to soak into the potatoes a bit more. Baking time was about 40 minutes in a 375 degree oven, stirring frequently. 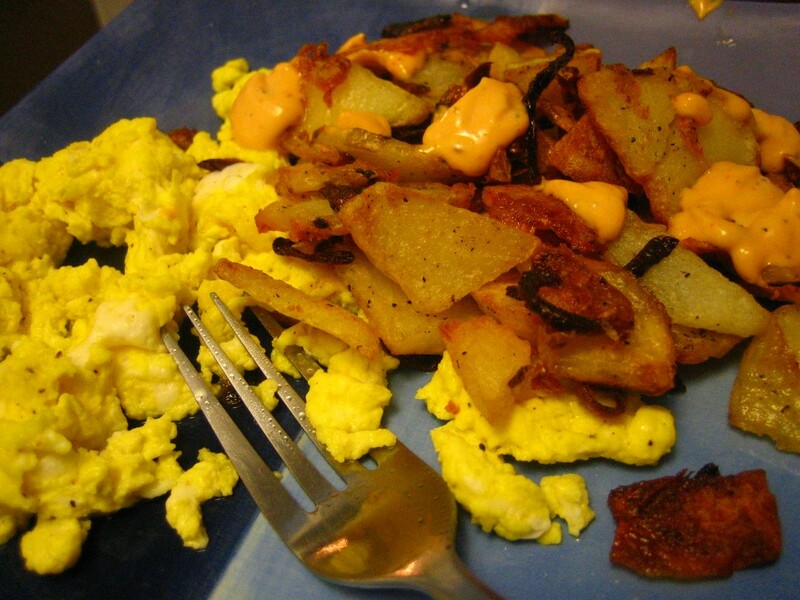 Scrambled eggs and chipotle sauce are welcome additions. Plain old hot sauce is great on these potatoes, as is nearly any sauce you might enjoy dipping french fries into (honey mustard, ketchup and mayo, etc.). This one is adapted only a little bit from Smitten Kitchen’s recipe. And let us say, this is more worth it than you can imagine. Do it. Roast the pumpkin. Enjoy the soup. 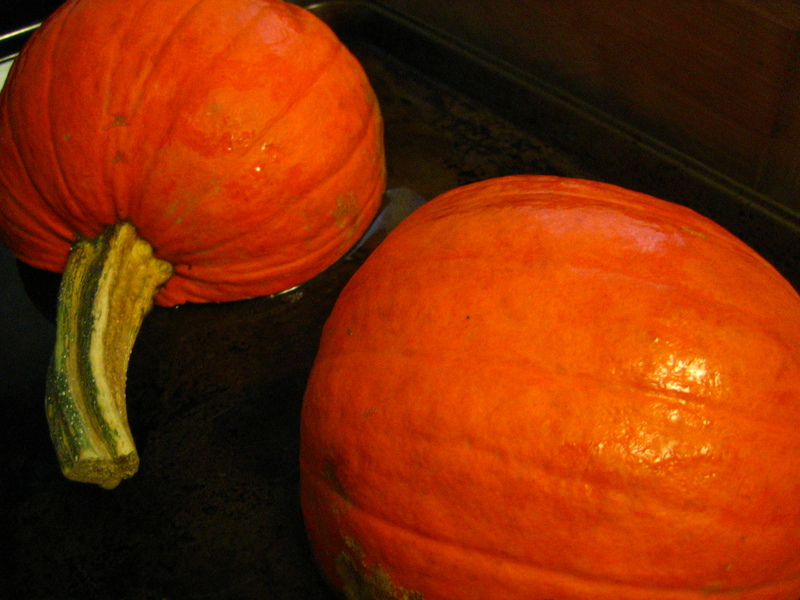 First though, roast and peel the pumpkin. We did this in the morning so that it was all set to go for the soup that night. 2. 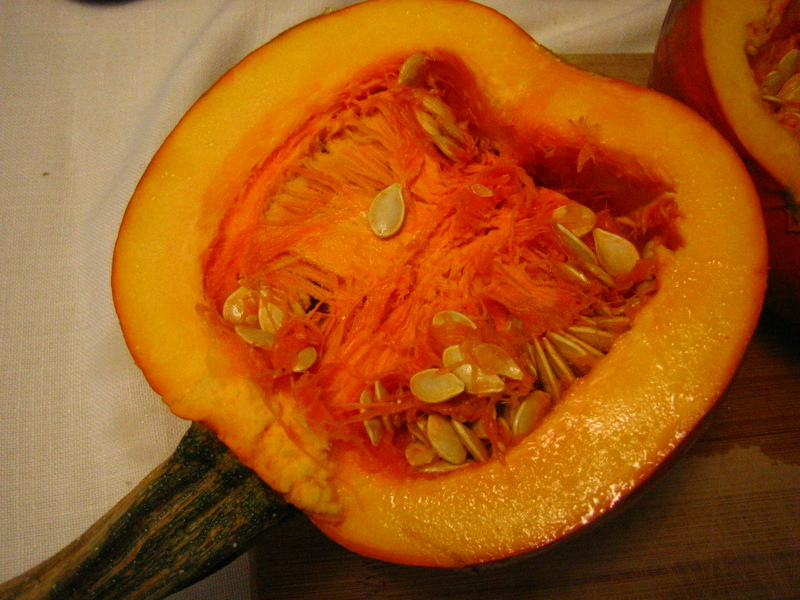 Clean the seeds and strings from inside the pumpkin. You can save these to roast and eat as a snack. 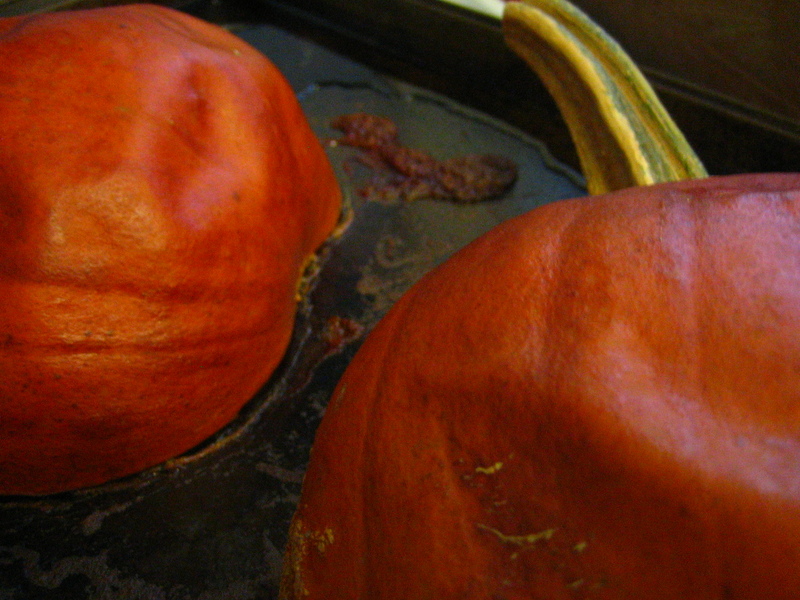 Put a little bit of water into a baking pan, and set both halves of pumpkin cut-side down in the pan. 3. Roast at 375 for about 1 hour and 15 minutes. Ours was probably a 5 lb pumpkin. For larger or smaller ones the time will differ. 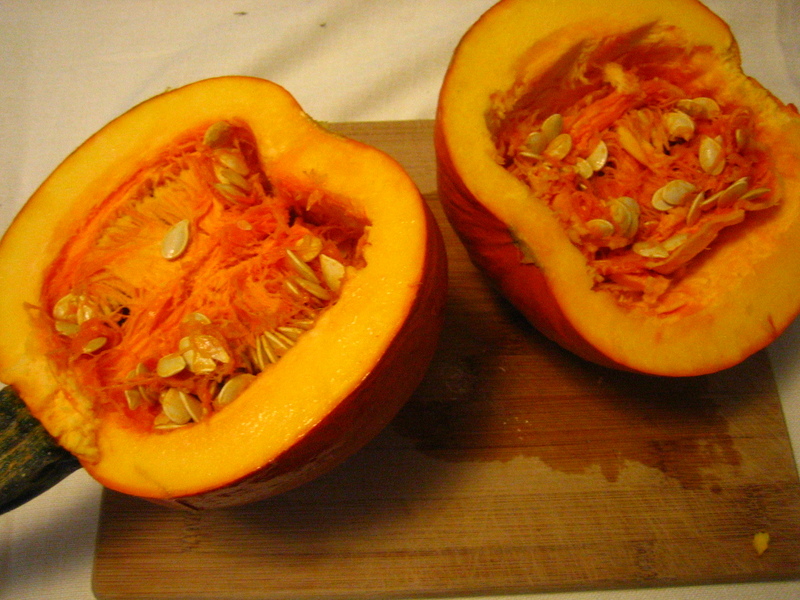 The pumpkin is done when you can easily slide a fork through the skin. The pumpkin will have a darkened, shriveled look to the skin, but fear not. 4. 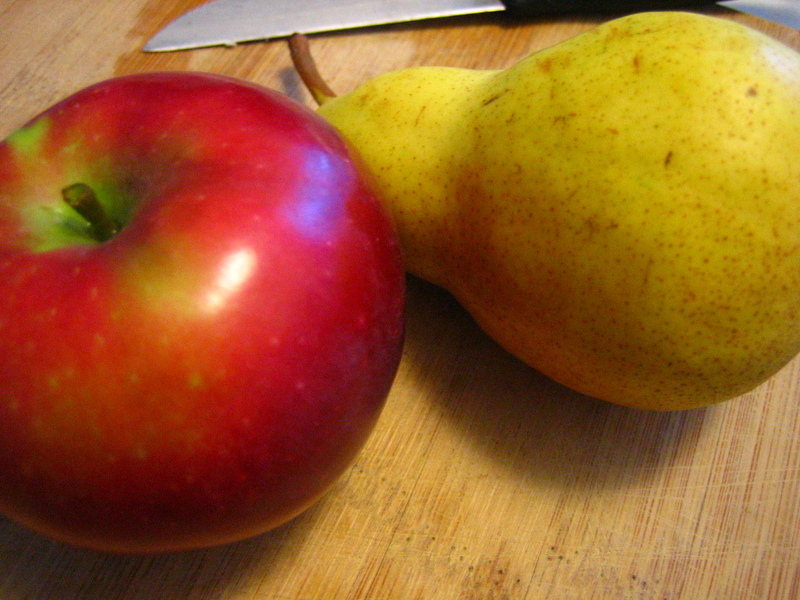 When it has cooled to be safe to touch, simply peel back that skin with your hands. It comes off quite easily and can be fairly satisfying to peel. 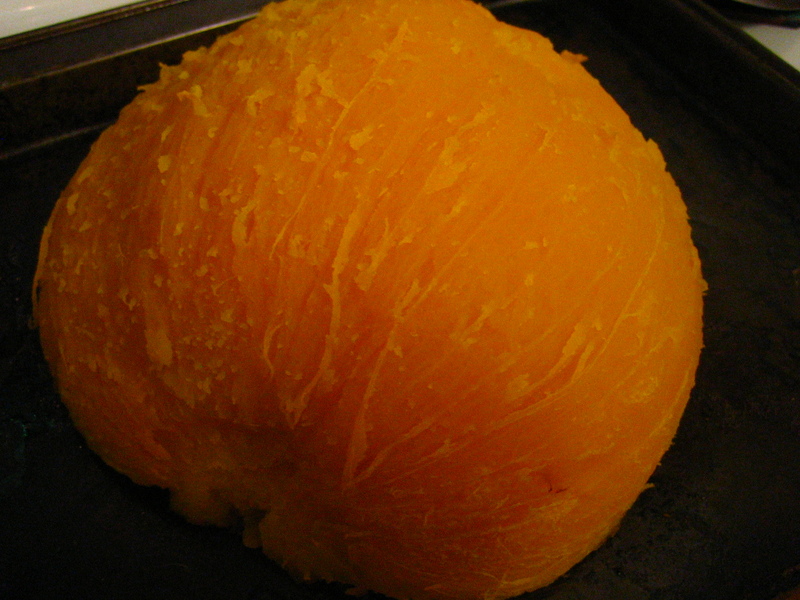 Then you have your peeled, bright yellow pumpkin all ready to puree. In a 6-quart heavy kettle cook onion, shallot, garlic, cumin, salt, and pepper in butter over moderate heat, stirring, until onion is softened and beginning to brown. Stir in bean puree. Stir in broth, pumpkin, and wine until combined and simmer, uncovered, stirring occasionally, 35 minutes, or until thick enough to coat the back of a spoon. AND: 2 of our very own eggplants!! !